Phigenics SCWMP course enables learners to improve facility water system safety and efficiency. The scope of the course includes an overview of industry guidance on safety and efficiency in building water systems and a detailed review of the process used to implement improvements in safety and efficiency. 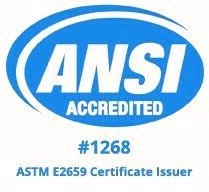 The course is in alignment with published industry standards and guidance including ANSI / ASHRAE Standard 188, the CDC Toolkit, and ANSI / ASHRAE Standard 189.1. Define a Sustainable Comprehensive Water Management Program. Identify the relevant industry standards and guidance for building water safety and efficiency. Apply hazard analysis principles to determine safety hazards and efficiency opportunities in a building water system. Describe the process for developing a Comprehensive Water Management Program based on industry standards and guidance. Identify what methods are available to control the hazards and realize the efficiency opportunities in a building water system. Develop the documentation necessary for a Sustainable Comprehensive Water Management Program. Describe how to develop program goals for their own building water systems for safety, efficiency, and cost optimization. Define verification and validation of a Sustainable Comprehensive Water Management Program. Explain cooling tower efficiency and how to calculate cycles of concentration. 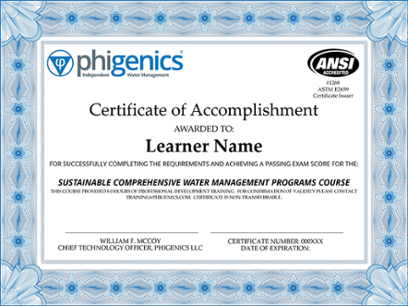 A Phigenics Sustainable Comprehensive Water Management Program certificate holder is equipped with the knowledge that enables them to improve the safety and efficiency of building water systems. A non-transferable certificate shall be issued to individuals found to meet all Phigenics certificate requirements based solely on the information gathered during the certificate program process. No other factors shall be used to determine an individual’s qualification to earn the certificate. CEUs may be available. Contact your organization for their specific requirements. Phigenics Sustainable Comprehensive Water Management Programs course provides 7 hours of professional development classroom training. The Doubleheader and Trifecta pricing increases after 2 March 2019. Registration available online at www.AFE.org or by calling 571-814-8296. Phigenics Clients receive AFE Member pricing for AFS 2019 and HFS 2019 by calling Tamika Martin at 571-395-8770. Personal information that is collected will be treated as confidential. Personal information includes Learner and certificate holder confidential information includes name, address, telephone numbers, emails, assessment scores, certificate status (except for an individual who has achieved a certificate). Confidential information about a particular individual will not be disclosed to a third party by Phigenics personnel (paid or volunteer) or contractor without the written consent of the individual. The certificate is the property of Phigenics LLC. Permission to use the certificate is granted to certificate holders at the discretion of Phigenics for permissible uses only. Use of the Phigenics certificate is limited to those persons who have been granted the certificate by Phigenics. Use of the certificate by individuals who have not been granted and maintained the certificate is expressly prohibited. Permission to use the certificate is limited to the certificate holder, and shall not be transferred to, assigned to, or otherwise used by any other individual, organization, or entity. If it is discovered that unauthorized individuals are using the certificate and contact information can be found, the Training Director or his or her assignee will send cease and desist correspondence. The Phigenics certificate may not be revised or altered in any way. They must be displayed in the same form as produced by Phigenics and cannot be reproduced unless such reproduction is identical to the certificate provided by Phigenics. Phigenics shall not discriminate or deny opportunity to anyone on the grounds of gender, age, religion, race, marital status, parental status, disability status, status as a veteran, sexual orientation or nationality. To request accommodations under the Americans with Disabilities Act, for complaints or appeals, receive verification and documentation of progress, completion, or to confirm an individual's certificate validity and term, contact: training@phigenics.com. Early-Bird rates end on Wednesday, 6 March 2019.